This shop is part of a social shopper marketing insight campaign with Pollinate Media Group™ and Hillshire Farm but all my opinions are my own. #pmedia #buy3save3 http://cmp.ly/3/8vNxcO. Make sure and scroll to the bottom of the post for info on a valuable coupon! You guys know I love a recipe that can be totally versatile! 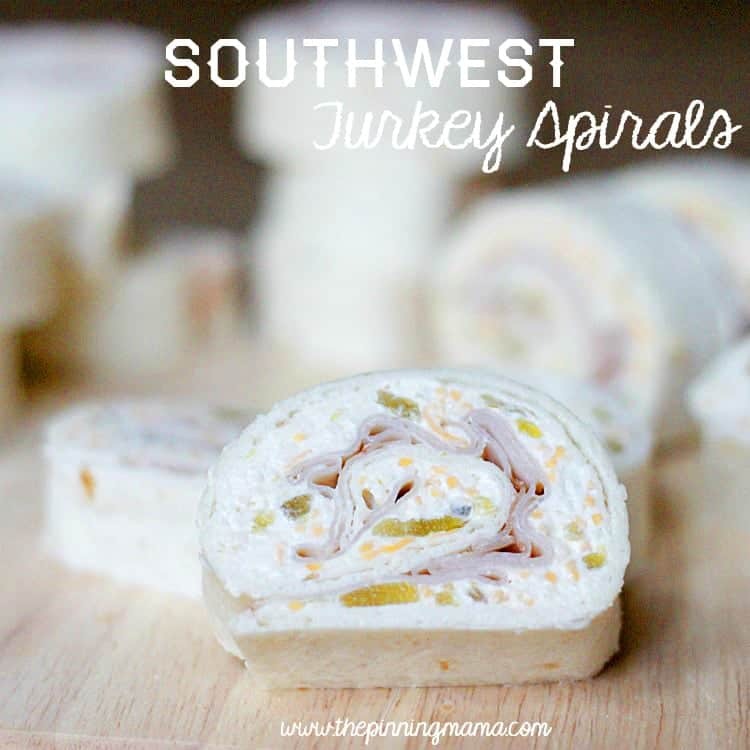 These South west Turkey Spirals can go from an appetizer at a tailgate to a bridal or baby shower or even be a great everyday lunch. 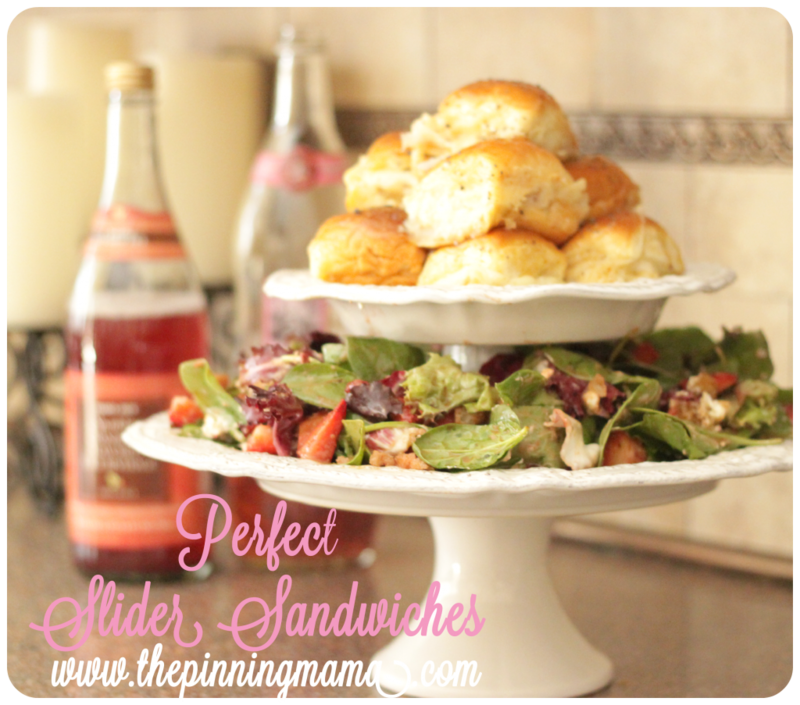 And of course you know by now that when I share a recipe it is always quick and easy! Last time I made these I was hosting a shower for one of my very best friends, but I was craving something with bold flavors so today I am just making them for lunch. 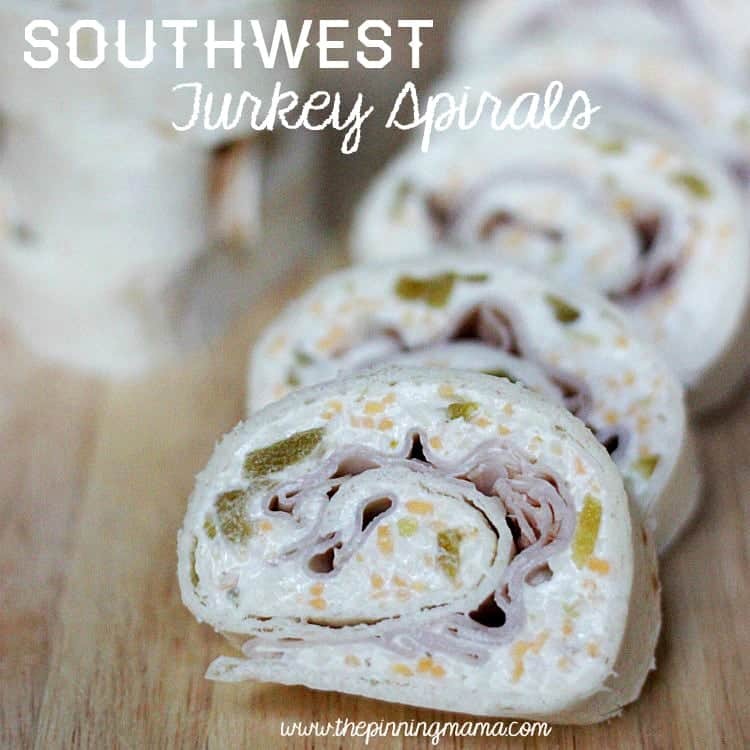 I have just been in a little bit of a lunch rut lately and Southwest Turkey Spirals are just the thing to boot me right out of it. Just because lunch is quick and easy to make doesn’t mean it has to be boring! 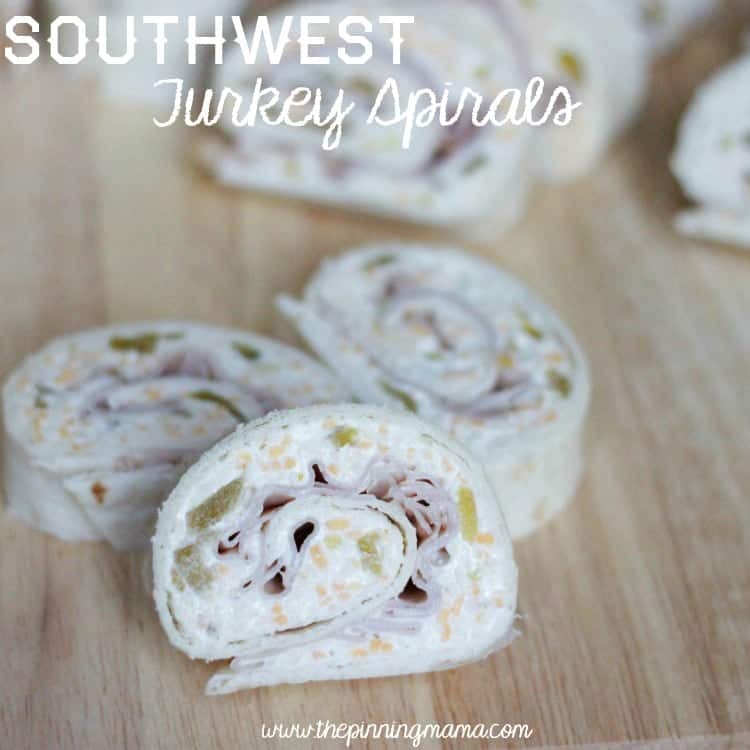 Southwest Turkey Spirals are filled with healthy turkey breast and cheesy goodness. The green chilis give it such a wonderfully unique flavor. That must be why I couldn’t stop eating them…. I almost didn’t have enough to photograph! To start, you only need 6 ingredients to make these little guys! I made a quick trip to Vons, which is both the nicest and most convenient store to my house, and then whipped these up in about 15 minutes (plus chill time!). That’s my kind of recipe! So gather up your ingredients and let’s get started! First mix your softened cream cheese, shredded cheese, green chilis and garlic powder together until well blended. Then you want to spread the mixture evenly on each tortilla about 1/4 inch thick. Next layer that yummy turkey flat on top of the cheese until you have covered it. Now you need to carefully roll it up by starting at one end and rolling it to the other end. Do this gently so you don’t squeeze out any of the goodness waiting inside! The waiting game now begins! Put your rolled tortillas in the fridge for about 2 hours so the cream cheese can harden back up and be perfect for cutting. Once your rolled tortillas have firmed, use a sharp serrated knife to trim off about 1 inch of each end so the ends are even. Then cut the roll up into about 3/4″ slices. 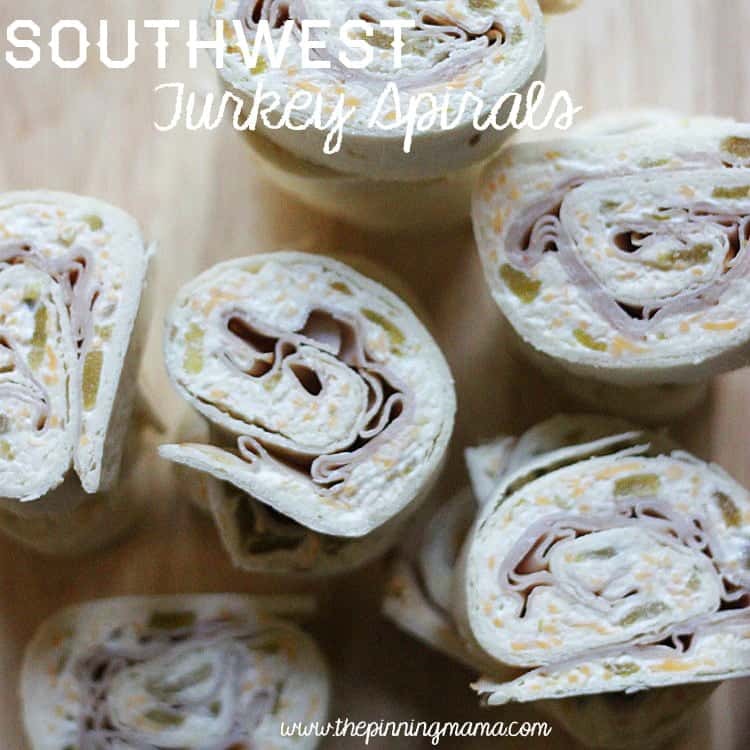 Each tortilla should make about 8 spirals. Perfect and ready to be devoured for my lunch! Or if you are feeling a little more generous than me, take them to watch the game, pack for a potluck, or put them on a pretty platter and watch them disappear at a shower! It is easy, yet beautiful party food. Now for the good stuff… I love a good deal, and there is nothing better than when the brands we work with partner with us to give The Pinning Mama readers a great special! When you sign up for the Hillshire Farms Just For U program you will save $3 when you buy any 3 qualifying Hillshire Farms products through their Buy 3 Save 3 campaign. I love mix and match promotions! This is perfect for hosting guests because you can save big and get everything you need to make a nice menu! For our guests coming over to watch football this weekend I will be making these with our Perfect Slider Sandwiches and these mouth-watering Sausage Stuffed Mushrooms. Let’s be honest… I am in it for the food not the football! 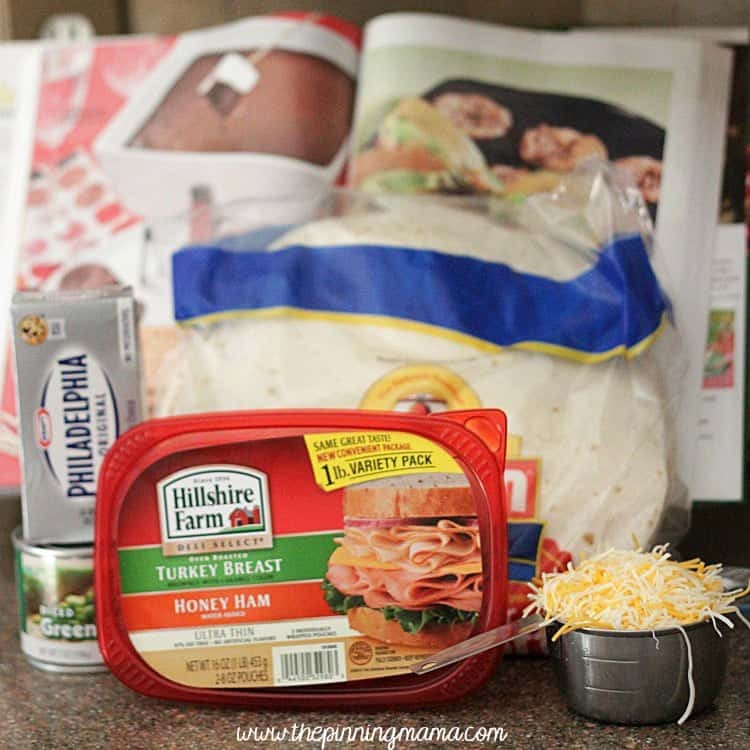 If you need more recipe ideas visit the Hillshire Farms website, and follow them on Facebook and Twitter for even more delectable inspiration! First mix the cream cheese, shredded cheese, green chilis, and garlic powder until well blended. Next spread the mixture evenly on each of your tortillas until covered. Cover the cheese mixture with slices of turkey laid flat. 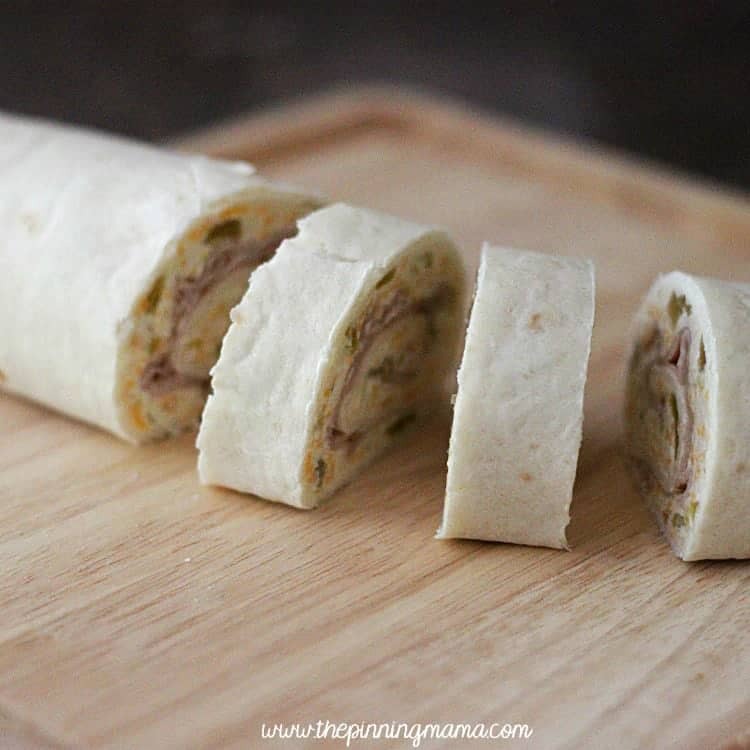 Start at one end and roll the tortilla gently until it is completely rolled up. Refrigerate for 2 hours or until the cheese mixture has firmed. With a sharp serrated knife, trim the ends off of each roll so that they are even. Thanks for all of your excitement on this post Jasmine! It made it so much fun for me to post knowing that you were looking forward to it! I appreciate you leaving us a note and hope you enjoy the recipe! You can make them without meat too! It is still a fabulous snack! Oh those look SO good! And I even have all the ingredients! Quick and easy lunch, here I come! Thanks Kat! I hope you enjoy them as much as we do! Even my tiny kids love them! I love the addition of the chilis. These would be a really fun change of pace in my husband’s lunchbox! My husband is all about these! 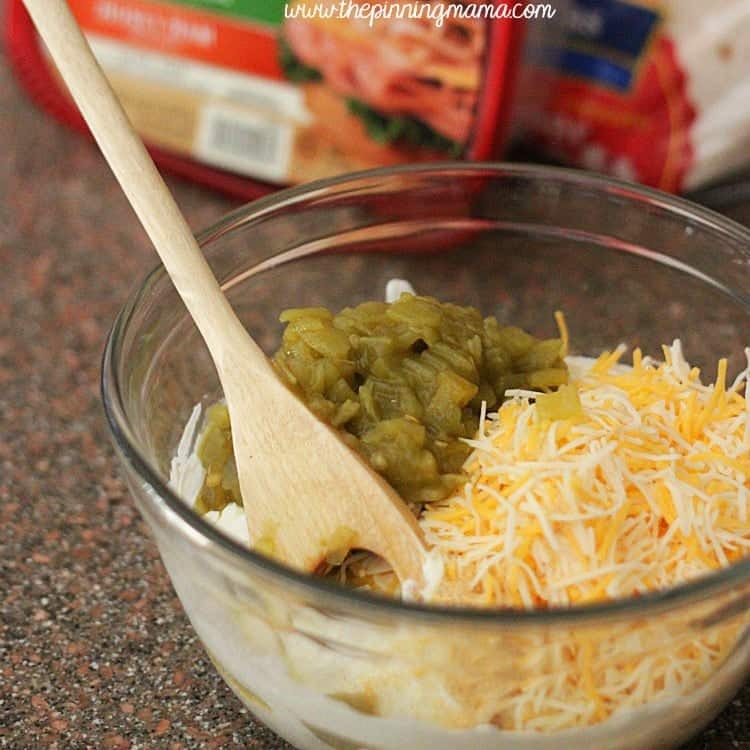 He loves green chilis and it really breaks up the monotony of leftovers and sandwiches!